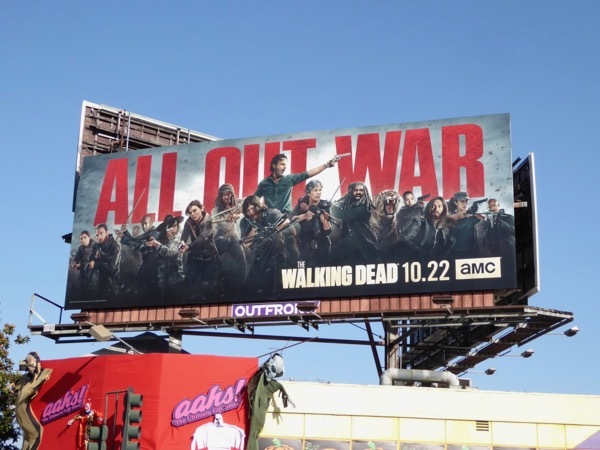 If the last season of The Walking Dead proved anything it's united you stand, divided you fall, and sometimes you have to stand up to bullies, no matter the cost (a lesson we could all learn in these trying times). 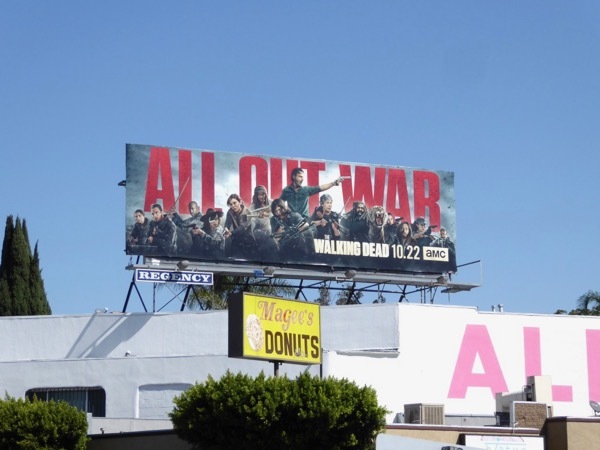 Now that the survivors of Alexandria, the Hilltop and the Kingdom have joined forces, it's time for 'all out war' against 'Negan' and his followers. 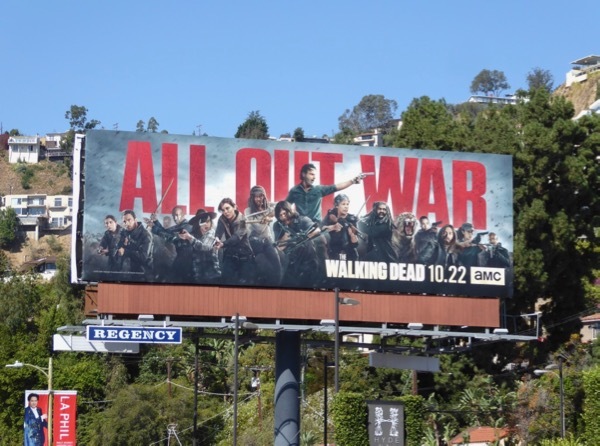 After all their personal losses, tragedies and tribulations 'Rick Grimes' and his extended family realise that they all need to fight with everything they have, sticks, knives, guns, crossbows, teeth and claws, in order to protect what they've achieved and built together in this deadly post-zombie apocalypse world. 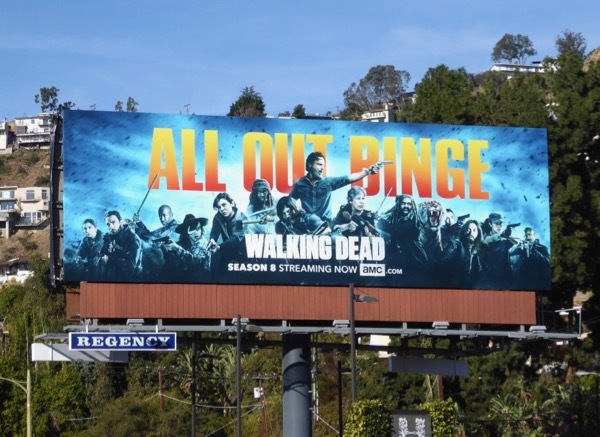 These season eight billboards were photographed along Sunset Boulevard and La Brea Avenue from September 24 to October 4, 2017. 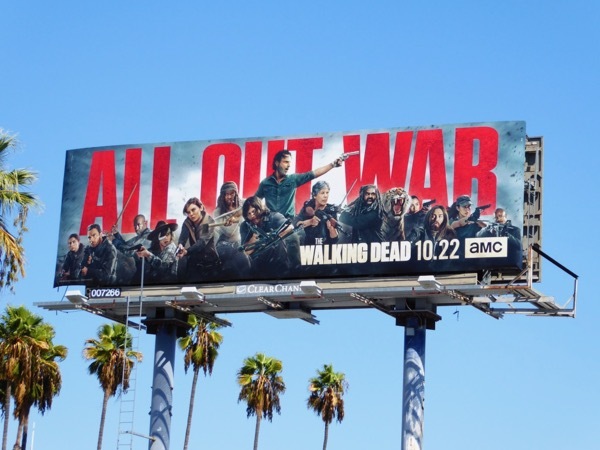 Fans of the zombie drama can also check out all these previous season promo billboards for The Walking Dead and for its spin-off prequel Fear the Walking Dead. 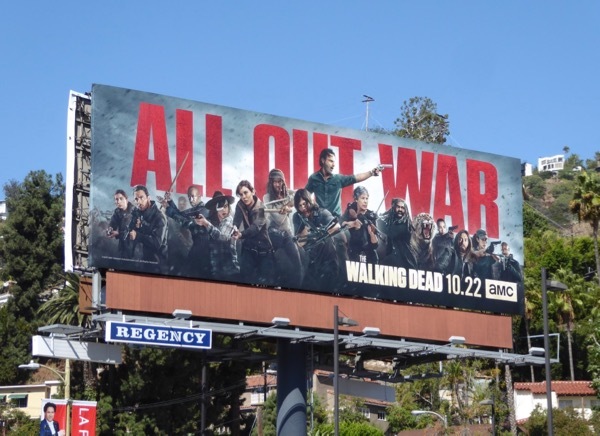 It's fair to say that the ranks of The Walking Dead characters have grown over seven seasons, so let's see just how many of them can survive this eighth installment, and whether it'll be humans or walkers that finish them off. 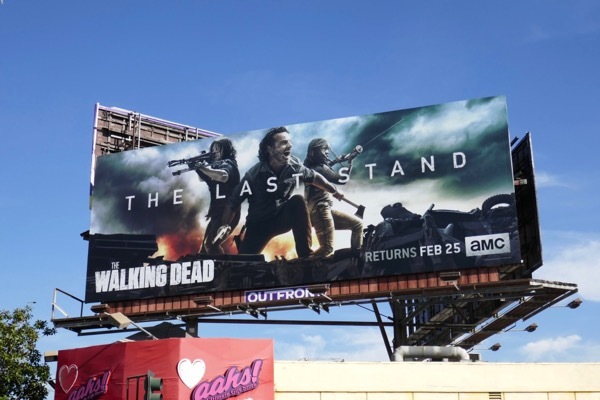 UPDATED: Here's another cool ad creative using this season eight key art with different colour filters for brilliant impact. 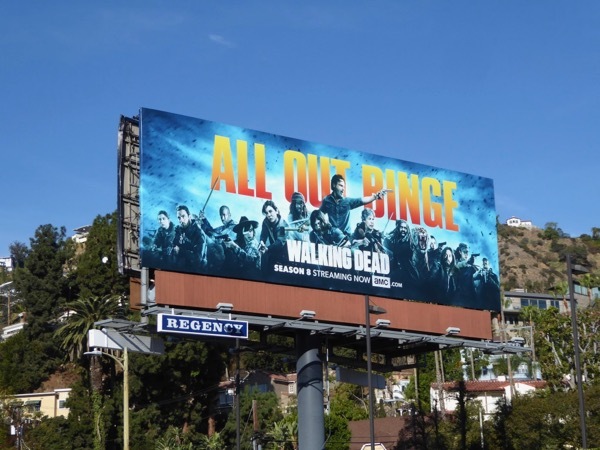 This 'All out binge' billboard for the first half of the eighth season to help you get up to speed was snapped along West Hollywood's Sunset Boulevard on December 28, 2017. 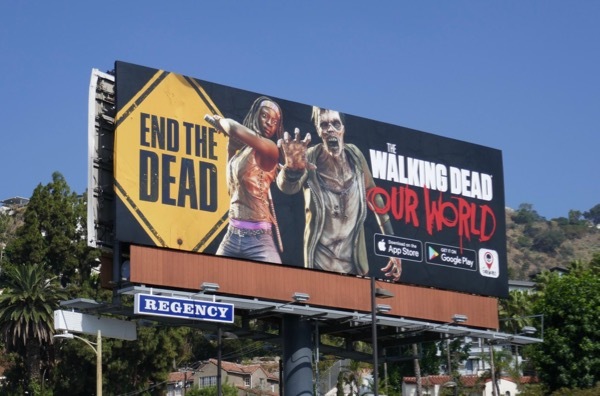 UPDATED: After the stunning reveal at the end of the first half of season eight with 'Carl' having been bitten by a Walker, there's no way the series can afford to lose any of these three fan favourites. 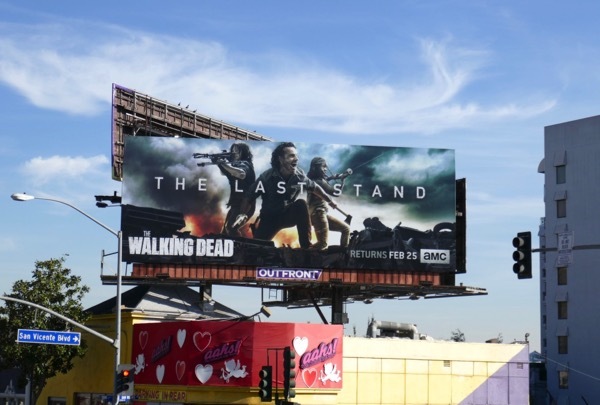 'Daryl', 'Rick' and 'Michonne' are making 'The last stand' against the Saviors in this midseason billboard snapped along the Sunset Strip on February 2, 2018, and it'll take all their crossbows, axes, guns, swords and smarts to win this one. 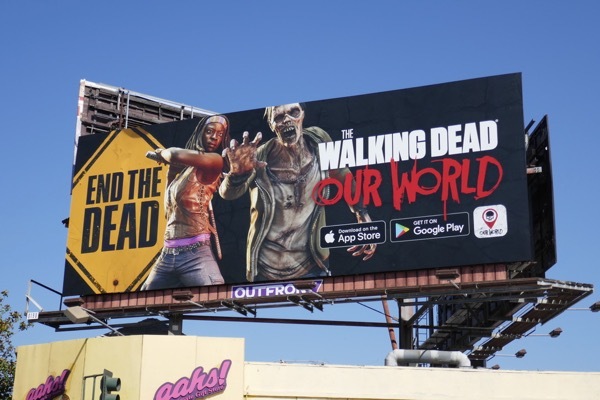 UPDATED: Here's also another billboard for The Walking Dead, this time for the Our World game app, featuring Dania Gurira as the katana-wielding 'Michonne', spotted along the Sunset Strip on August 21, 2018. 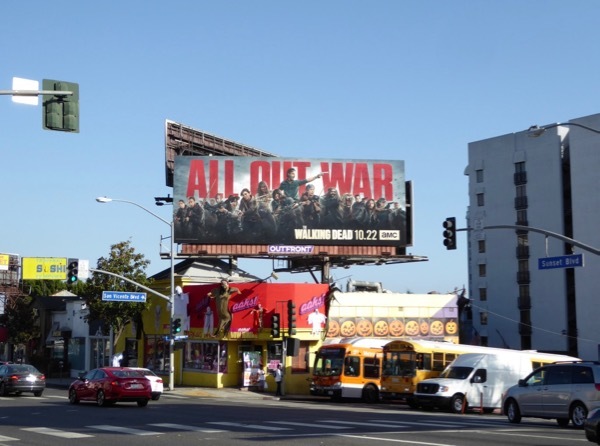 And here's another ad example spotted further east along the Sunset Strip the next day.